August is always a short month for boat building when you take a 2 week vacation. Ok, no more excuses... But I have had a small diversion. 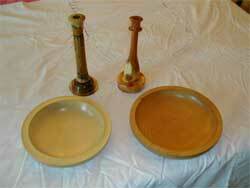 Earlier this year we went on a wood turning course, here's the proof (mine are the two pieces on the right and the better ones are on the left). 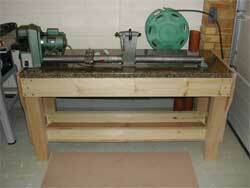 Well, within a few days of finishing the course my father secured a small lathe. But it needed a bench, so here I am making yet another bench.